For many years, I chose to ignore you, to shun you, to shrug my shoulders and say “Eh” whenever you were mentioned. After a quick 3-day visit to Colombo back in 2002, I never thought about paying a visit to your shores again. This was despite 30 trips to India, your neighbor to the north, and despite rumors from other travelers that you really were an excellent and affordable beach destination. Why did I treat you so? Honestly, you just didn’t sound that appealing to me. You didn’t seem like the kind of destination I would enjoy or be interested in and so, I never found it justifiable to spend the money for a visit. Back in January this year, after spending a month in Bali and after a couple of unexpected hiccups with our travel plans, my girlfriend and I found ourselves in East Timor of all places, unsure of where to go next. We had two and a half weeks and nowhere to go. We threw around some potential destinations – Taiwan, Malaysia, Thailand and so on – before deciding on Sri Lanka. My girlfriend told me that her friends loved their experience there and that was all it took as we really needed to choose a place. We did some research. We chose the beach town of Unawatuna as our base. We booked our flights and accommodation. Our flight from Kuala Lumpur to Colombo, Sri Lanka arrived late at night and so we stayed at a guesthouse near the airport. The following morning we hired a taxi for the 3 hour ride down to Unawatuna, sharing it with two other travelers we had met. Before long, we arrived in Unawatuna, coming in along the main road. And I began to get nervous. I simply didn’t expect there to be a heavily trafficked main road in this supposedly quiet town. But just as the sweat began dripping from my forehead, the driver turned right into a small lane, and the traffic instantly disappeared. A few minutes later we were in front of our accommodation. And just like that, we began to fall in love with Unawatuna and Sri Lanka. Asia’s Perfect, Affordable Beach Destination? I’m honestly not sure if there is another affordable beach destination that offers the same value in terms of accommodation, food and activities along with such a high quality beach, lack of crowds and incredibly welcoming atmosphere. And I love my beaches! It’s a small town, with really one main lane that winds around from the main road, along the beach and then into the forest. There are smaller lanes that branch off here and there and then you have the 1 kilometer long beach. For the most part, nothing is more than ten minutes walk away from anything else. Also, even though we were there in high season, the town was by no means crowded. You could easily meet other people if you wanted to but you could also have a quiet vacation as well. The atmosphere is very laid-back, most of the travelers here are backpackers or mid-range tourists and while you can find some nightlife, it’s not a huge party place. I’d say this town has just a little bit of everything you could possibly want from an affordable beach destination. It’s simple. For a beach town, Unawatuna is a great value. You could get by for as little as $35 USD per day if you stayed in a budget room at a guesthouse and ate at the local restaurants or food stalls around town. It’s pretty hard to spend money here since it’s the perfect setting to just relax on the beach and partake in some simple activities, but when you do have to open the wallet, it rarely makes much of a dent. Also, the entire village is within a few minutes walk of the beach, so you can always pop down for a quick swim or a breath of that fresh salty air whenever you want. There are very few vendors on the beach and the restaurants are set back quite a ways from the water, leaving the beach itself remarkably quiet and peaceful. In the evenings, several restaurants set up on the sand right as the sun sets, creating a pleasant atmosphere ideal for a drink or meal. But at any time of the day, it always remains quiet, making it feel as if you’re in some far more remote and less affordable beach destination! 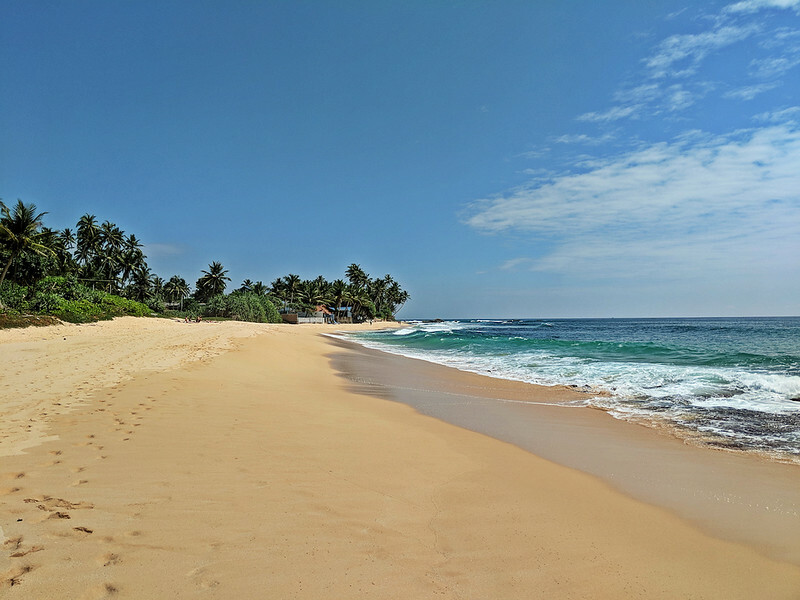 As a bonus, Unawatuna is only a 25 minutes walk (or 5 minute rickshaw ride) away from Dalawella Beach. This idyllic stretch of sand never had more than 4 or 5 people on it and while the sea was rough and swimming pretty much impossible, it’s a gorgeous beach worth visiting nonetheless! 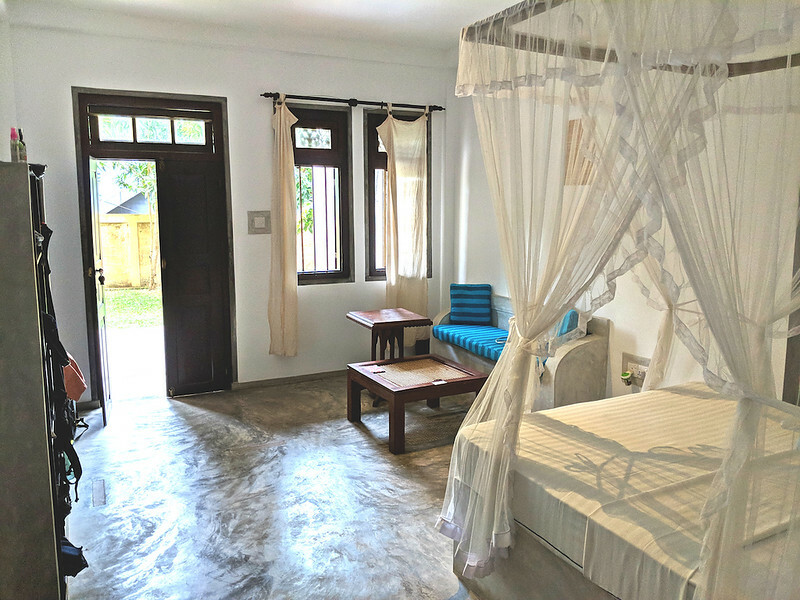 There are dozens of options for all budgets – dirt cheap dorm rooms, well-priced private rooms in all kinds of guesthouses, nicer rooms in boutique hotels, simple shacks down by the beach, rooms for rent in family homes and so on. We chose the Silva Rest Guesthouse, pretty much based on the photos of the room and the lush, tropical property. And it turned out to be one of my favorite places that I’ve stayed at, ever! It all starts with the young couple that owns the place, and their staff, all of whom are beyond lovely and helpful as they go out of their way to ensure that every detail of every guest’s stay is perfect. The rooms are spotless, spacious and creatively decorated, with super comfortable beds, a sitting area and a great bathroom (weird to say but it was!). 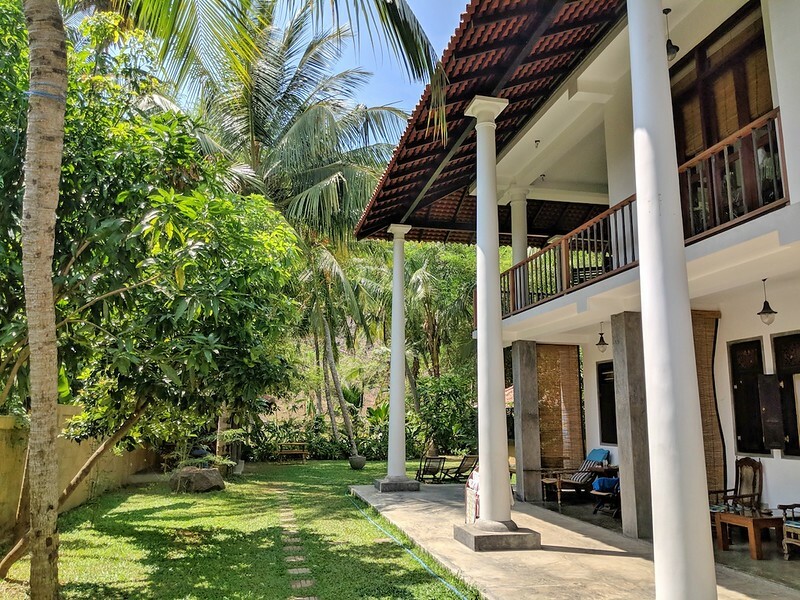 We had a front terrace with two chairs and a table and the building was set in a remarkably quiet plot of land that was full of lush trees, bright green grass, a garden and mini-jungle and a mountain backdrop. The only noise we heard was of the colorful birds hanging around outside our room. There were also massive lizards wandering around the property and even the odd peacock flew by from time to time. We had an outdoor communal kitchen to use, with all the equipment you could possibly need, and a covered seating area, ideal for enjoying the freshly made, local and huge breakfast the owners serve up every morning. And to top it off, the Silva Rest Guesthouse is only a 3-4 minutes walk from the middle of the beach. As you can tell, we really loved this guesthouse. Meals ranged from $3 USD for local curry and rice to $8 USD for a whole fresh fish or proper stone-oven pizza to $15+ for a full seafood meal on the beach. 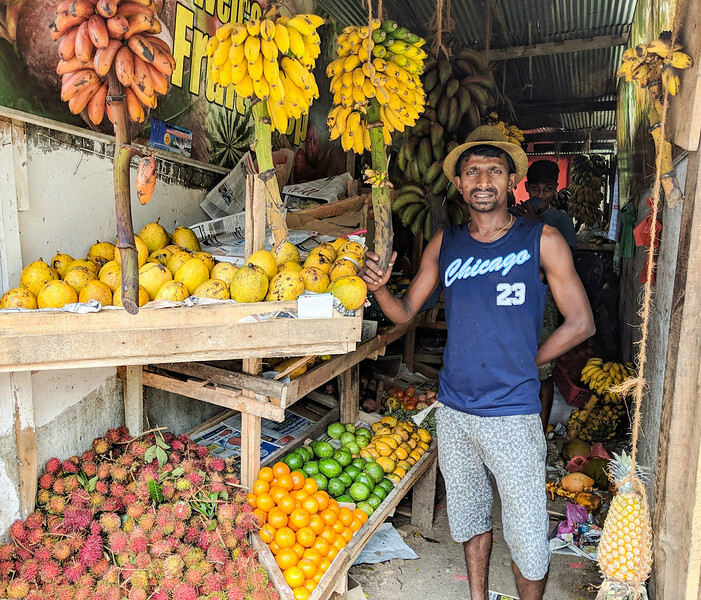 And be sure to visit this guy and his fruit stall, located right next to Jina’s Vegetarian Restaurant! 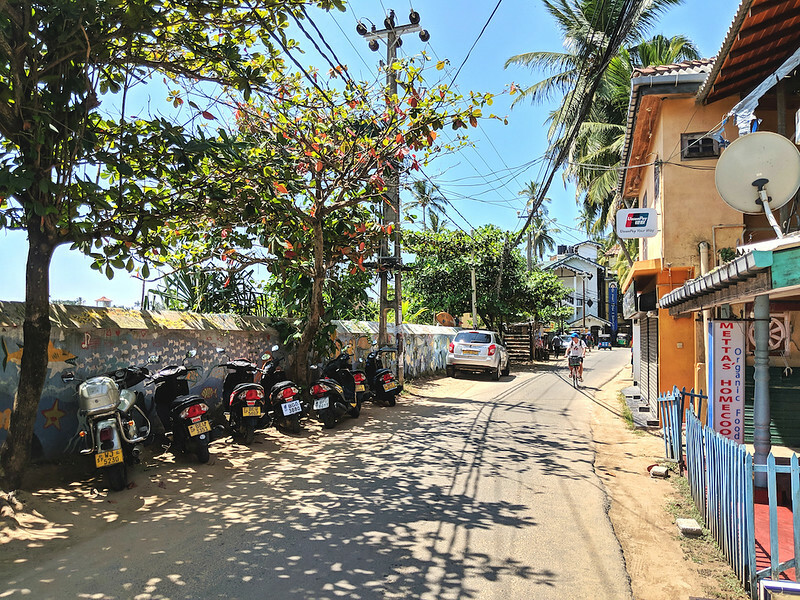 Right in Unawatuna, apart from strolling up and down the main lane and hanging out at the beach, there are also a handful of other options to spend your time. You can rent stand-up paddle boards for about $8/hour. There are jet skis, too. A bunch of yoga teachers advertise their classes and there’s a meditation center. You can hike 45 minutes to the more remote Jungle Beach, visit the Japanese Peace Pagoda, go snorkeling or scuba diving, take cooking classes or even go whale watching at the right time of year. You can rent scooters for a few dollars per day and cruise up and down the coast, stopping in dozens of villages and random beaches along the way. 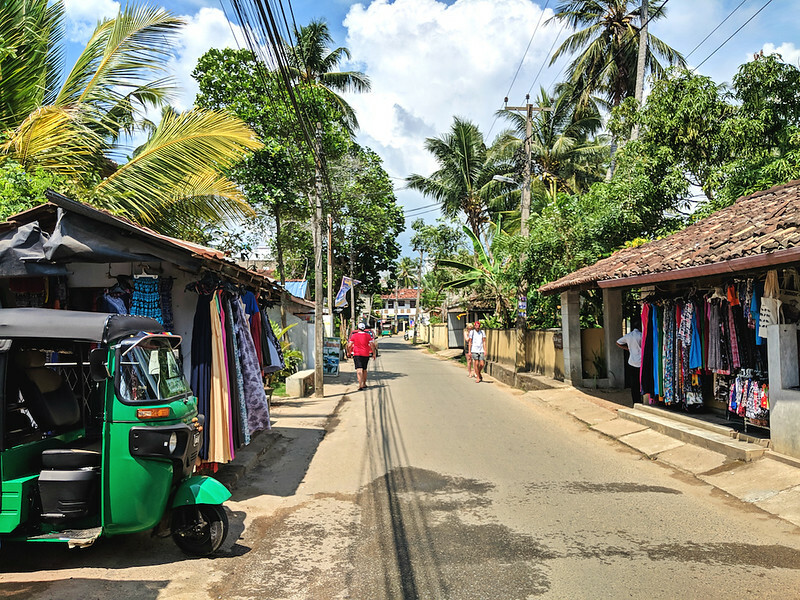 And of course, you can hop into a rickshaw for the 15 minute ride up to the town of Galle, where you’ll find the Galle Fort. This old Portuguese, and then Dutch, fort is still a living, working town and we ended up visiting twice because it was such a pleasant experience. 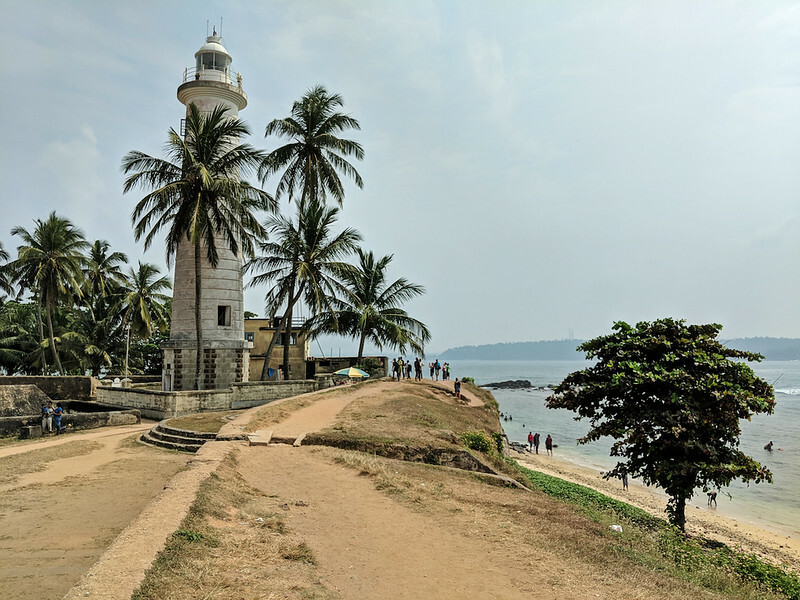 You can wander the quiet lanes of Galle Fort, walk on top of the outer wall along the water and listen to live music or check out the local stalls in the park at Fort Square. You can step into one of the many cafes on Pedlar Street for an excellent meal and check out some of the free art galleries and free museums (the Historical Mansion Museum was especially interesting with it’s huge collection of antiques!). In the evenings the town becomes even more atmospheric once it’s all lit up and things quiet down a little. …and plenty more than that of course. So, on that note, thank you once again Unawatuna! You gave us a brilliant two and a half weeks. Never did we expect to find one of the most perfect and affordable beach destinations in all of Asia. And we’re quite confident that you’ll feel the same if you choose to visit too! As a US citizen… do you need to purchase a travel visa to enter Sri Lanka? Or are you eligible for a (free) visa-on-arrival? I would like to plan a trip to this island nation in the near future. Your post has inspired me to want to go there and the photos are amazing. I want to check out the beach for myself. Thanks! 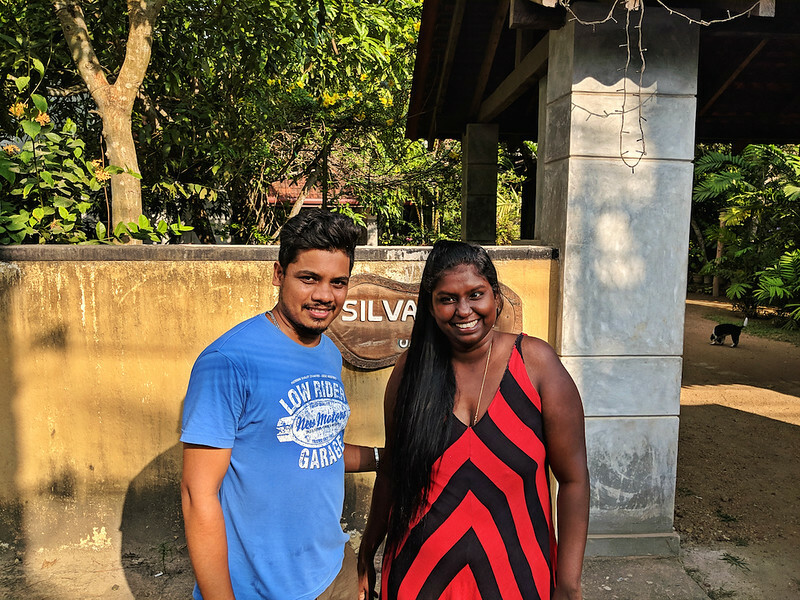 Hey Jake – To enter Sri Lanka, you simply need to register on their government website for an Electronic Travel Authorization before you travel there. It only takes a few minutes to complete the form, you hear back quite quickly and the cost is only $20 USD. You then take the confirmation of that authorization with you when you arrive. I’m embarking on a trip to Spain in the near future and I wondered, what’s your favorite accommodation while traveling and working on your laptop? What’s your experience with staying in hostels and still having a productive work day? Hey Markus – I think you can stay in hostels but maybe not work there, or find a hostel that has a very large common area so that you can go in a corner to work. But usually, if I stay in a hostel, I go out to a cafe to work during the day so that I don’t have any distractions. It’s all about discipline! So if you really make sure you get your work done, you can be productive anywhere! Sweet review! Ya know why? After a month in Colombo back in 2013 I found myself saying the same thing. Wifey went to Kandy for a week during the trip. I hung out at the Big C for da month. This is good to know because Sri Lanka is now back on my travel list. Sucker for an awesome beach and Unawatuna seems to have it. Thanks dude. 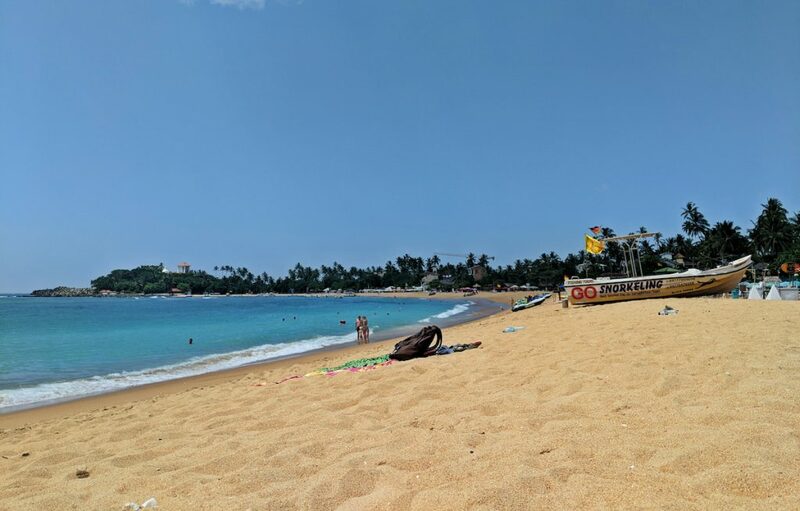 I think Unawatuna Beach has to be our next Sth East Asian holiday destination your script and stunning photos have sold it so well – thank you Derek, as usual an excellent blog, love your quirky introductions too! Hey Mary – I don’t think you’ll be disappointed! If you have any questions about it when you start planning, don’t hesitate to let me know! Sri Lanka is in my sights but I think that 2018s new island for me will be the worlds biggest….. Greenland. At a quarter of Australias size nearly a continent! Biggest island I’ve been to so far is great Britain, the 9th biggest on earth.back to sri Lanka the climb up mt. Adams is said to be very good. Hey Kevan – Greenland works too! Let me know how that goes! Happy Birthday. Wishing you as many gifts as you give!! Thank you Linda, I appreciate that!! Looks like a truly amazing place to visit. Will definitely be on my list in the future. Hey Barret – You’d love, especially for all the activities and exploration you could do in the surrounding areas! What a timely article for me to receive as i am now looking a place for my husband and I to go to for January 2019. I can’t take another winter in the northeast like we just had, need warmth and sunshine but also very low key and affordable. I clicked on booking.com for the Silva Rest but it is fully booked (darn!) were there any other guest houses you happened to see or check out that you liked? also, how was the weather in Jan. warm and sunny? i do not believe it is their rainy season. How about the bugs? mosquito? Lizards I can live with, they are awesome creatures. The weather was beautiful in Jan/Feb when we were there. About 30C/90F every day and I think it rained twice for about an hour. And there are some mosquitos in the evenings but we just put on some local repellant that you can buy everywhere and we didn’t have any problem. It’s definitely a place worth looking into!! Hey Gunther – Yes, still a nice, relaxed place! 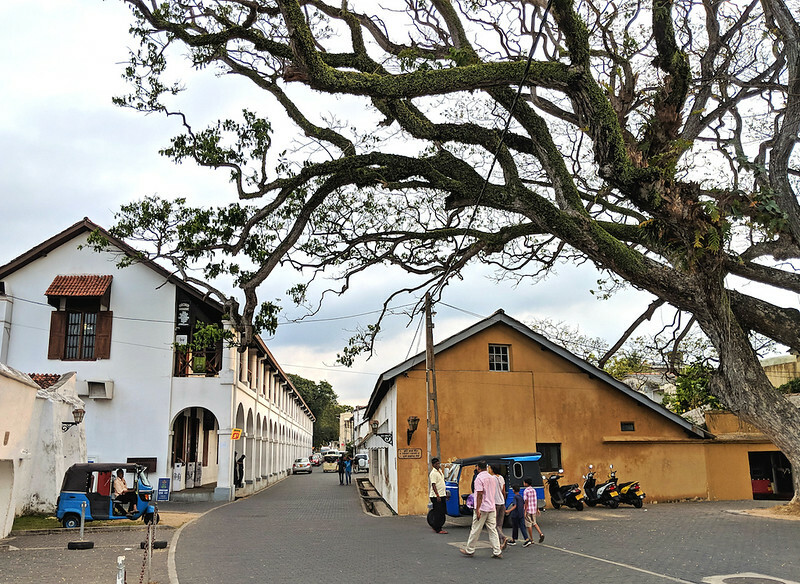 And I agree about Galle…such a great town. I can’t believe I had never heard of that place either. Must have been cool to visit 20 years ago! Just a note to thank you for this latest update from Sri Lanka as it’s on my to-see list. It really looks fascinating and magical. By the by…thank you for the LOST CAMPERS referral. I took one of their vans to attend the RTR (See links below) in Quartzsite, AZ in January. It was your blog that inspired me to lead the nomadic life, and I intend to be moved into an RV by year’s end. By the way, my trip to Iran last November, 2017 was absolutely amazing. Regardless of what the American corporate media is telling you, Iranian people are traditionally very kind and hospitable towards guests-even Americans. I was surprised to find out that almost half the population is under 40 and are pro-western. It wouldn’t surprise me in the least if we see some big changes in the next few years. If I recall correctly, you’ve got a birthday coming up soon. I’ll close this note by wishing you a fun-filled birthday and a new year of cool travel and adventure. Hey Malcolm – Thank you for the birthday wishes! It is coming up in a few days. And congrats on getting even closer to your nomadic lifestyle with the RB…that’s going to be an incredible adventure and I look forward to hearing stories from the road. Also happy you had a good experience with Lost Campers as well and that your Iran trip was so positive. Seems like your travels really are off to an ideal start and I also wish you many more cool adventures ahead my friend! !